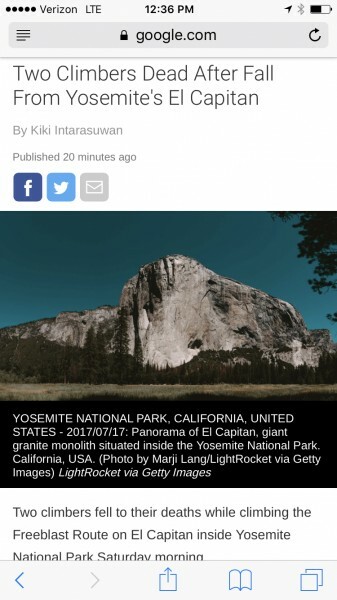 Death on El Cap (Freeblast) this morning? My wife just texted me this news story. Any confirmation or details? My sincere condolences. I can confirm that this happened. 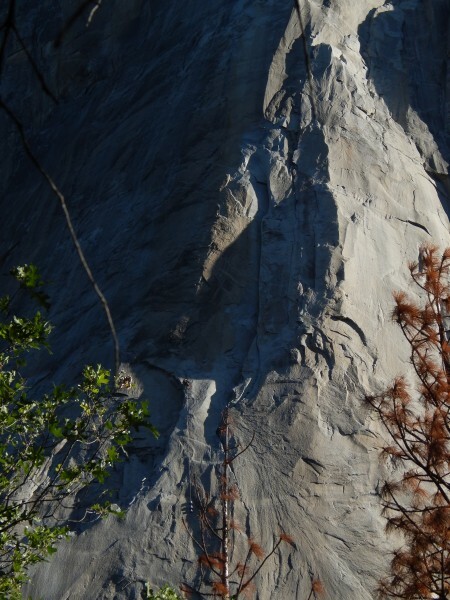 Lisa and I were at El Cap this morning hoping to witness the attempt on the Nose speed record. We could see climbers ascending on Sickle Ledge and on Freeblast, and could also see John Long's (birthday) party at Camp 5 with their portaledges. When Alex and Tommy hadn't appeared, and since I hadn't actually walked to the base since moving back from my life in Hawaii more than 7 years ago, we decided to walk up to the base. Not familiar with the direct route to the base, we wandered toward the SE face but figured we had to go westward and passed by the third class section at the beginning of the Nose. Shortly after, a woman yelled down, telling us that there was a body up there and not to come up but to tell SAR where to go when they arrived. Then a group of three came down, saying there was a second body above, and I lent them my binos so they could search for their friends who were climbing Freeblast. Diligent search with binos yielded no climbers above now. Once back at the road, we found that most of the spectators who'd come to watch Alex and Tommy had departed. But one woman said she'd heard a scream followed by a "thud." Very subdued and saddened, we send sincere condolences to all family and friends. 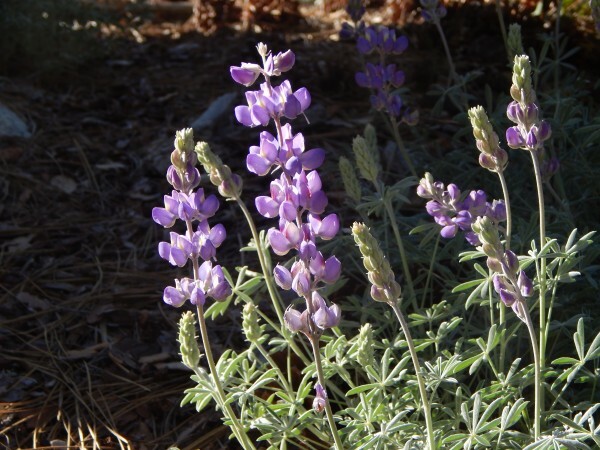 Dwarf Lupine, blooming this morning on the walk up to the base of El Cap and offering some solace in their beauty, considering today's tragedy. Edit: Were they simul-climbing for speed? With bolted belays on Freeblast, did something go wrong there to pull the belayer off? Other possibilities? We will have to await the report from YOSAR. The time when the El Cap photo above was taken was 8:10 a.m.
Condolences to the families of the fallen. Thanks for the update boodawg. Sorry you had to witness that. Much appreciated. Oh God, shock. Worst nightmare when an adventure ends in tragedy. Condolences to the loved ones, family and friends of these two. Gut wrenching. Such sad news heart goes out to friends and family! Just heard from Alex.... he and Tommy are fine, as is Largo's crew. 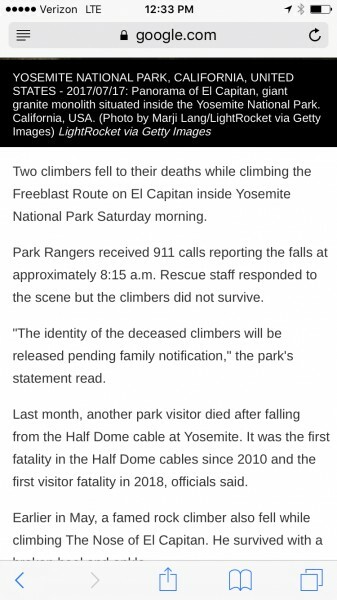 Sounds like the climbers were from Boulder but that is hearsay at this point. Two people's parents and loved ones are very sad right now. Rather quirky to have happened on such a hard route, where only experts tread. Sorry to all. Thanks for the low-down Ken. Also rather quirky for both to fall during what I assume was while ascending. I can think of only a couple scenarios on that route. Regards to friends and family. Maybe they were bailing/rapping off the route? Sad. I offer my sincere condolences to the Family and Friends of the fallen climbers. Maybe they were trying a speed ascent, simul-climbing with minimal gear, and the gear pulled? I think many of us are taking the dangers up there a but lightly - be careful folks, place gear , maybe even more gear than you think you need. I remember that when MIcah Dash and Jose went for an el Cap speed attempt, they fell, and both were left hanging on only one piece of gear, with one biner. heard from Pete they might have fallen from Mammoth Ledges. F*#k that is high.. Terrible, terrible news. That's a land of black belt trad climbers up there, could have been any fluke. Tiny strands of cord and diligence keep us alive up there but the walls are high and so many chances for mistakes to happen. Sincere condolences to family and friends of the departed. Even experts can make mistakes/lapses in judgement. And you never know when fate will give you the chop. This is a time to remember to tell those who are important to you, how important they are to you. In case you don't get that chance again. It was two experienced climbers in their late 30s early 40s. With family and kids. Their names have not been released publicly. They were attempting to salathe in a day. Which would have been done easily. Witnessed by a party on the freeblast right next to them. Attempting as a party of 3. It was a weird situation and still unclear what had happen. The park released their names They are: Jason Wells, age 46, of Boulder, Colorado and Tim Klein, age 42, from Palmdale, California.